Identity Guard Review 2017 - Is this Identity Theft Protection any Good? Offers all the basic protections at a great price, but most of the value-added features are reserved for expensive premium tiers. Identity Guard’s parent company got its start in 2001 as a credit monitoring service. It later expanded to more products, including antivirus and its signature identity theft protection service. Launched in 2013, Identity Guard has been one of the most consistently well-reviewed services on the market. We put it through its paces in this review to see if it really holds up to the hype. Identity Guard offers three main plans starting out at US$9.99 per month. The base plan, Essentials, will provide the typical monitoring, alerts, protections, and victim assistance. Identity Guard will monitor the web, databases, and online black markets for your personal information, including your social security number, bank account numbers, and credit card numbers. The real question that always arises when reviewing identity theft protection services: What can they do that you can’t do on your own for free? Black market and database monitoring definitely fall into that category. Every tier comes with $1 million in insurance to compensate victims of identity theft. This review will focus on Essentials but we’ll include some info about the other two tiers as well. Lost wallet protection promises to help cancel and replace lost or stolen cards, including insurance cards, credit cards, and driver’s licenses. Lost or stolen cards can be a pain to cancel and replace, but can almost always be done without a third party’s help. Identity Guard likely makes the process easier, though. Finally, base tier users can use Identity Guard’s ID Vault app, which securely stores and memorizes all your passwords, making them easily usable with just one click. Similar apps and browser extensions are widely available free of charge, however. Check out our guide to making and remembering strong passwords. The next two tiers, Total Protection and Platinum, cost $19.99 per month and $24.99 per month, respectively. They are pretty much identical, except Platinum offers monthly credit score updates as opposed to the quarterly ones that come with Total Protection. Those credit reports come from all three bureaus and otherwise cost between $10 and $12 each, so if monitoring your credit report is a concern, that can add significant value. The base tier comes with no credit reports or scores. Total Protection and Platinum plans will additionally monitor address changes and public records. Subscribers also get a few bonus tools, including access to their Identity Guard account via mobile app, PC antivirus software, and keyboard encryption software. Those are nice extras, but shouldn’t be the deciding factor when purchasing a higher tier plan. The internet is full of quality, reputable, and free antivirus and keyboard encryption applications. Identity Guard offers a free 30-day trial of the Essentials tier, but you must input a credit card number to take advantage of it. Be sure to cancel before the 30 days is up if you decide against subscribing. Alerts are sent to the user asking to verify activity whenever information is updated on your account–passwords and addresses, for instance–or when someone tries to open new accounts or subscriptions under your name. Most credit card companies and banks allow you to set up activity alerts on your accounts free of charge, so there’s less value in that, though they won’t track thieves opening new accounts under your name. 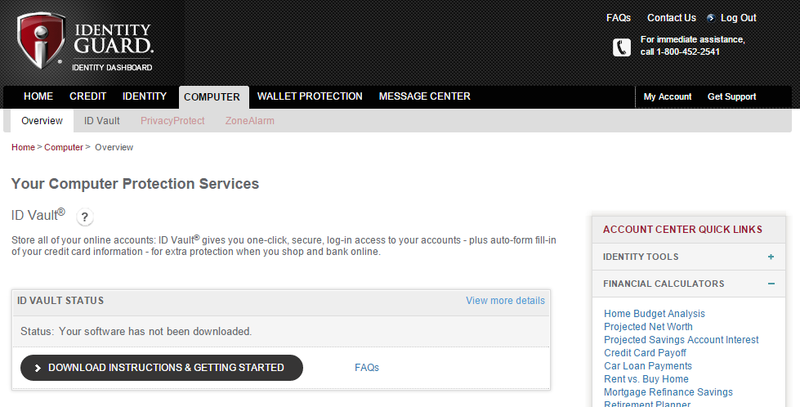 Alerts are sent via email and show up in the Identity Guard website’s message center. You can also get notifications via the mobile app if you subscribe to one of the premium tiers, but there’s no option to set up SMS or push notifications on Essentials. 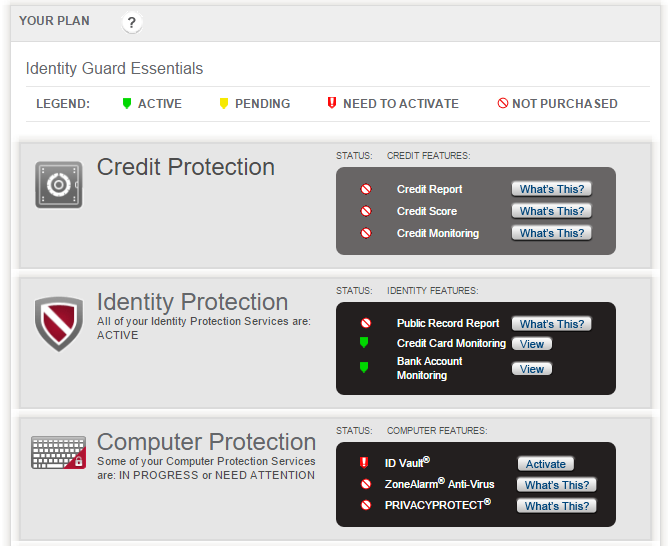 Identity Guard Essentials lets you register up to 20 credit cards and multiple bank accounts for monitoring. That’s more than some competitors, but there’s no way to register additional email addresses, phone numbers, or your driver’s license. Overall that makes it less comprehensive than competitors. Setting up your Identity Guard account is a fairly straightforward affair. Input your personal details, then your social security number, bank account numbers, etc all in one go. Monitoring bank accounts requires a routing number and bank name, so keep those handy. You’ll have to answer a few of those annoying verification questions, like what was the name of your elementary school and what was the name of your first dog. Somewhat worryingly, there’s no two-step authentication process or even an email verification of your account. The home page includes your message center, where Identity Guard will let you view, filter, and sort an archive of alerts or notifications you’ve received. Below that is a list of features and their status: active, pending, need to activate, and not purchased. The entire right hand column is littered with advertisements pushing for upgrades to the next tier and other offers. Essentials users will be constantly reminded that they didn’t pay twice as much for credit reports. The other tabs include identity, computer, wallet protection, and message center. Identity, somewhat confusingly, lists all of your data that’s being monitored. This is where you can add more bank accounts and credit cards. The computer tab is where you can download and setup the password manager, keyboard encryptor, and antivirus. The wallet protection tab is just a list of instructions for what to do if you lost your wallet. If that happens, you’ll have to call the phone number given, as there’s no way to do it through the website. The message center is the same archive of alerts and notifications as what’s on the home page. Overall, the interface is easy to figure out but the labeling could use some work. The two premium tiers come with access to Identity Guard’s mobile app, but we’ll skip over that in this review since we’re focusing on the base plan. Despite being an internet company, Identity Guard relies heavily on telephones to communicate with customers. If you lose your wallet or spot fraudulent charges, call the 1-800 number. If you have a question about your account or some other non-urgent inquiry, call the 1-800 number. There’s no live chat or even a ticket submission system. That said, a call to customer service left me satisfied. I was put on hold for about a minute before getting in contact with a representative, who first asked several questions to verify my identity. Customer service was helpful and polite. The website’s support page provides a decent assortment of FAQs and other resources for things like filing insurance claims and credit disputes. Other than the ads on the website, I haven’t received any spam or promotional offers from Identity Guard in my inbox. Identity Guard offers an affordable basic tier with most of the protections we’ve come to expect from identity theft insurance companies. Some of the features of the premium tiers seem like they should be included in the basic tier, however, such as public records monitoring and SMS alerts. Customer service is solid but almost entirely phone-based, with no live chat via the website. Essentials subscribers will be constantly reminded by advertisements that they aren’t paying more than double for the premium tiers.